Striker Chris Wood's double all-but sealed Premier League safety for the Clarets as they saw off Cardiff City at Turf Moor. The 27-year-old former Leeds United forward will finish the season with double figures in the top flight for the second season in succession after netting in either half against the Bluebirds. Three games ago, Sean Dyche's side were facing a fight for survival when a four maqtch losing streak had sucked them back in to trouble. But victories over Wolves, Bournemouth and City has now lifted the club 11 points clear of the relegation zone with four games remaining. Burnley could have been out of sight at the break after carving Cardiff City open time and time again in the first half but the hosts were forced to settle for a slender advantage. Chris Wood should have given Sean Dyche's side an early lead when Dwight McNeil swung in a free kick from the left hand side, James Tarkowski helped the ball on but the New Zealand international guided his header against the post when getting above Lee Peltier. Tom Heaton and Neil Etheridge made routine saves to keep out Josh Murphy and Ashley Barnes at either end while the Bluebirds winger, signed from Norwich City in the summer, zipped a second chance wide of the upright after collecting Kenneth Zohore's pass in a central position. The home side continued to grab the game by the scruff of the neck and McNeil cleared the crossbar from the edge of the box once Jeff Hendrick delivered his pass first-class from the right hand touchline. Ashley Westwood is rubbing shoulders with some of the most creative players in the Premier League when it comes to assists. The midfielder 's output is only bettered by the likes of Christian Eriksen, Eden Hazard, Ryan Fraser, Paul Pogba, Andrew Robertson, Leroy Sane, Raheem Sterling and Joao Moutinho. The 29-year-old has no issues what-so-ever in that department but his goalscoring return could be improved upon. The former Aston Villa man may have scored twice in four games for the Clarets, having gone nearly three years without a goal in the top flight, but he could so easily have added to that. He only had Etheridge to beat when threaded through by Barnes but the finish was tame and the visitors survived the scare. 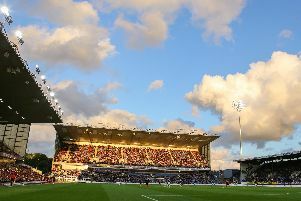 However, Burnley took the lead on the half-hour when McNeil supplied the corner and Wood shrugged off the attention of Victor Camarasa to beat Etheridge with a free header. Westwood had another opportunity to make Burnley's afternoon that bit more comfortable when Barnes, once again, played the perfect pass to send the Player of the Year candidate clear. This time the midfielder forced Etheridge to work as the goalkeeper saved with his legs and another golden opportunity went begging. A second goal would have given Neil Warnock's side a considerable mountain to climb in their battle to beat the drop back down to the Championship. And Burnley almost had it when Hendrick, shooting from right to left, couldn't quite pinpoint the far corner. Tempers flared a number of times in the first half, which appeared to boil over in the tunnel at the interval, and it was the away side who returned the more fired up of the two sides in the second half. The Clarets spent the early stages camped in their own half, unable to retain possession as City pressed and probed. The Bluebirds looked like they had found a route back in to the game when referee Mike Dean pointed to the spot for an incident involving Ben Mee. Harry Arter's attempt from inside the box appeared to strike the centre back's hand while a cross from Joe Bennett also hit the defender's arm. There was a pause in the game, as Dean conferred with his assistant, until the match official reversed his decision, which, of course, infuriated Warnock on the sidelines. Arter went on to flick the top of the crossbar when whipping the ball towards goal from Junior Hoilett's pull back and the former Blackburn Rovers forward fluffed his lines from 12 yards out when Zohore had got in behind the Clarets' defence from skipper Sean Morrison's clearance. City soon ran out of ideas, Warnock ran out of changes, and the hosts took charge of the situation. Etheridge palmed Mee's header clear at his near post from McNeil's delivery but the hosts wrapped it up in stoppage time. McNeil did incredibly well to beat Aron Gunnarsson and substitute Nathaniel Mendez-Laing on the left hand side, the England Under 20 winger's cross took a nick off Bruno Ecuele Manga and Wood nodded in to an empty net for his second of the afternoon.